1) Double-dipping – I don’t care if you 3 or 93 this is by far the most disgusting of communal eating wrongs. What makes you think I want your saliva in my taco dip? How about I come over and put a booger in your spaghetti sauce? I feel these two things are equivalent. Even worse is watching a snot nose kid put a soggy sucked-on Ritz back in a couple of times. YUCK! And yes this goes for chefs putting the spoon back in the pot after a taste. 2) Touching all of the food – I once watched a 6 year old touch every piece of cake on a buffet line. I think he was counting them?? Yay for math, boo for your frog-catching grimy mitts on the dessert. You know children don’t wash their hands (neither do some adults) and they for sure itch their privates, play with their gum and pick their noses. This goes for dipping your bare fingers into bowls of food, cakes, etc. Tongs, people, tongs!!! 3) Eating the best part of a dish to pass – Please quit eating all the cheese off the bean dip, all the bacon off the baked beans and picking all of the shrimps out of the pasta salad. Yeah, I know, it’s your favorite part. But it’s everyone else’s favorite part too!! What entitles you to the cream of everything? 4) Eating over the pan – I went to one of those charity-social downtown type of things where they were serving a buffet of appetizers for the crowd. I’m minding my own beer when my friend A.M. says “Aw hell naw” and points out a fella eating a chicken wing over the whole chafing dish of wings. She strolls over to tell this guy the wing pan ain’t his momma’s kitchen sink and to grab a plate like a civilized person. AHAHAH. Get ’em girl. I mean really… these are adults!! 5) The presumptive addition – Please do not squeeze lemon over the seafood appetizer we are all about to share! I hate lemon on my fried seafood and you ruined it for me! Same goes for salting or saucing. Also, as someone who strives very hard to make good food, please do not automatically salt my food before you eat. It shows your lack of forethought and an impulsiveness I find to be a character flaw. 7) Blowing your nose in a restaurant – I’m halfway through a plate of bacon and eggs and you Mr. Booth-Next-Door decide it’s a good time to clear your sinuses into a hanky. Take it to the restroom! 8) The loud extended burp – So many people feel it’s OK to burp loud and long at a table full of people. “It’s a compliment in Arab nations -hahah” STFU, it’s gross. 9) Talking on the cell phone at dinner – It’s rude. It’s even ruder at a restaurant. It’s a rare treat for me to get to go out to eat and I don’t want to listen to you on the phone whether your my dinner companion or someone close by. Oh, it’s an important business call? Fine. Take it to the lobby. Now that I think about it, it is just as rude at home where I’ve spent time and energy to make a nice meal, tell them you’re at dinner and to call back, they’ll understand. 10) Rude to the server – Making someone take 5 trips to the kitchen because you think of something you want each time they return is rude. Speaking down to staff is rude. Making a server stand there while you take 5 minutes to decide… rude. Tipping poorly, rude. They are a server, not a servant. I think everyone should spend 6 months as a server so they understand the grueling nature of restaurant service. They would never tip poorly or be obnoxious again. Oh and if your toddler just left a explosion of finger food all over a 5 foot radius, tip even better. 11) Taking half a donut from the break room. 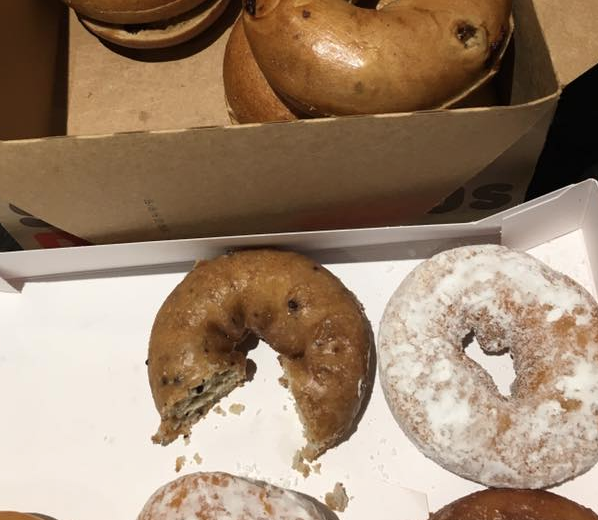 Here’s the thing, either you commit to eating a donut or you commit to NOT eating a donut. By taking a half you are just letting the next guy know that sadly they only get half of their favorite donut. (If they can get past the idea that you probably touched it to saw it in half). If you had eaten it entirely there would be less pain not knowing what might have been. Also taking half a bagel. OK I get bagels are a lot of carbs for one meal. If you’re going to take half a bagel, take the bottom half. Taking the top and leaving the stump is rude. Might as well take the whole thing because no one wants a stump OK? 12) Don’t feed the animals. So here in Florida we have seagulls, please don’t feed them. Our dinner will henceforth be ruined by a flock of dirty beach bum birds looking for another french fry. Also don’t give my dog people food. She’s prone to ralphing when not on her diet. (Off topic PSA: Bread is bad for ducks, feed them the duck chow in the gumball machines or nothing at all). This entry was posted in Ranting on September 1, 2015 by v1kk1. I can’t believe how some families leave their tables after their kids drop food all over the floor and seats. Slobs. Not that anyone would expect them to break out a vacuum, but at least make an effort by picking up the larger pieces. I was in a restaurant when a guy in a booth a few tables away busted out his electric razor. No Orange food! Like Doritos, Cheetos, things that will get dropped, get wet and stain.